CIYMS will have to wait another week to mathematically seal the Robinson Services Premier League title, but a seven wicket win over Waringstown at The Lawn on Saturday means the race is all but over. Waringstown won the toss and batted on what looked to be a good wicket in spite of the bad weather earlier in the week, and that proved to be the case with the ball carrying through well to wicketkeeper Chris Dougherty from ball one. CIYMS got off to a flying start when Allen Coulter bowled Adam Dennison for 10, before he claimed the scalps of James Hall and Lee Nelson to leave Waringstown 37-3. Coulter’s opening spell was full of pace and aggression, and he now has 41 wickets for the season, with only Andre Malan (43) collecting more. Matt McGillivray was introduced into the attack and struck almost immediately when he had James McCollum caught in the slips for 16, and with the rain arriving shortly after, the game was reduced to 48 overs. Shaheen Khan was looking in fine touch and was sitting on 24 when he edged to Dougherty off McGillivray to leave Waringstown 75-5 and in desperate need of a partnership. Captain Greg Thompson is one of the most destructive batsmen in the NCU, and plays the sweep shot better than any player in the Union, but he had a slice of fortune when he was dropped on 0 before another extended rain break. Another six overs were lost, further reducing the game to 42 overs, which left Waringstown 15 overs to bat on the resumption of play, and Thompson would make CIYMS pay for their slack fielding earlier in the day, reaching his half-century from 55 balls. Kyle McCallan was playing an important role and the pair rotated strike well until the last few overs when they went into overdrive, with McCallan hitting Coulter’s final over for 26, including three massive sixes. The 114 run partnership helped swing the momentum in the home sides favour, with Thompson ending on 71* and McCallan’s late flurry moving him to 46* as Waringstown ended 194-6 from their 42 overs. Curiously, Duckworth Lewis recalculated their score down to 191, so CIYMS were left a target of 192 to win, and their chase got off to the worst possible start when John Matchett was bowled by Khan for 6, and Dougherty was caught after a good short ball from Phil Eaglestone for 2. When Jones was bowled by McCallan for 19, CI were 35-3 and would have been worried, but from that moment on Hunter and van der Merwe put on a batting masterclass in how to chase down a target under pressure. The pair didn’t offer a single chance throughout the duration of their innings, with Hunter reaching his half-century from 55 balls before van der Merwe joined him at the landmark shortly after, with his coming from 53 deliveries. The duo continued to mix smart running with clubbing blows, and sealed a seven wicket win with what turned out to be minimal fuss. Greg Thompson can’t be accused for a lack of trying to find a wicket, as he regularly mixed up the bowlers in an attempt to find an answer, using seven in total, but the batting was just on a different level and was pure class from both. Hunter ended 77* and van der Merwe 79*, with the 158 run partnership putting CIYMS 12 points ahead with three games to play, and with their superior run-rate, the title is all but heading to Belmont for the first time since 2012. They have now won their last four league meetings against Waringstown, which is a phenomenal achievement considering the quality of opposition. The challenge for them now is to turn themselves into an all-conquering team and produce these type of performances in the likes of the Irish Cup and Challenge Cup, because they will potentially be disappointed with the way results have went outside of the tremendous league campaign. After an opening day loss to North Down, Jones’ side have won 10 in a row, and it is the dominance that they have exerted over anyone standing in their way that has been exceptional. 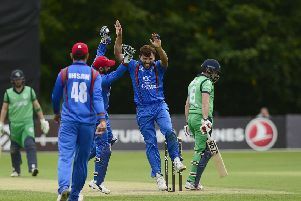 They have won three matches by a margin of over 100 runs, and a further five by more than five wickets, which shows they have rarely faced any sort of adversity during this campaign. Their match against CSNI was postponed on Sunday, and they will look to round the season off with a bang in their remaining games which also includes a trip to Instonians and a home clash against relegated Armagh.